The Villaggio Stromboli hotel was created at the end of 1949, two years after the last shoting of Rossellini's film. The hotel is built in eolian/mediterranean style and has a stunning position, directly on the sea, between two solidified lava flows. Surrounded by two creeks, the beach just in front is a mix of black sand and pebbles.The hotel is about 900 meters far from the port and 400 meters from the village center. 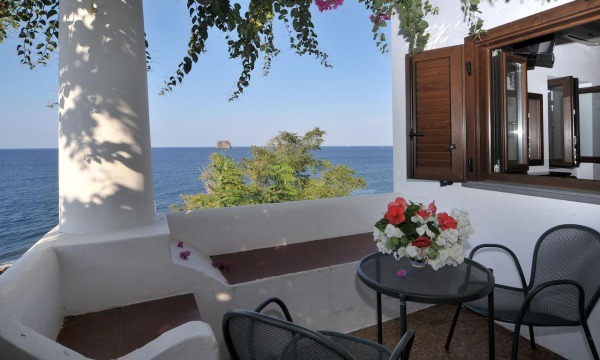 All of the 37 rooms are furnished and the majority have an amazing seaview and face Strombolicchio. All the bedrooms offer a terrace, bathroom, TV sat, frigobar, safety box, ceiling blade ventilation, air conditioning. At disposal of the guests are two restaurants, one covered where the guests can have breakfast, the other one open air with three big terraces few meters away from the beach. The cuisine is tipically mediterranean. Are you interested in more accommodations in our network? Check this box and tell us your ideal holiday using the field "Note". We will help you with no commitment to choose the best tailored made tour for you!